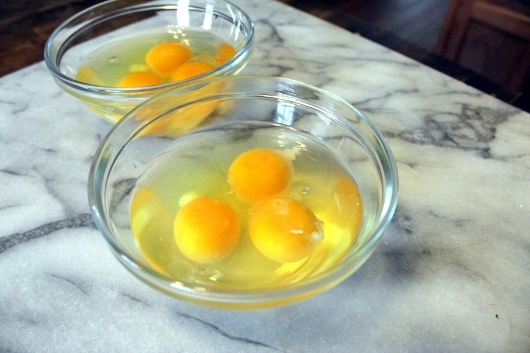 First things first: Taking care not to break the yolks, crack 3 eggs into a small bowl, and then set them aside. 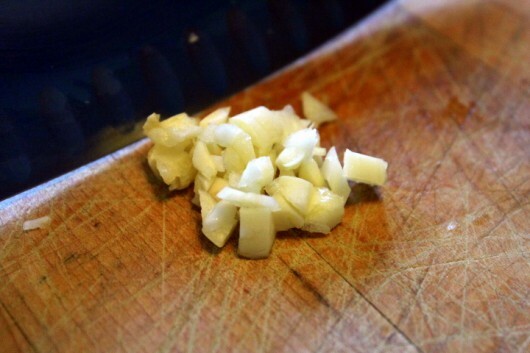 And one clove of garlic. Do you still have garlic left from last summer’s harvest? I do, but it’s stored in my garden shed. And the snow is so deep I can’t open the door. I hope you feel sorry for me. 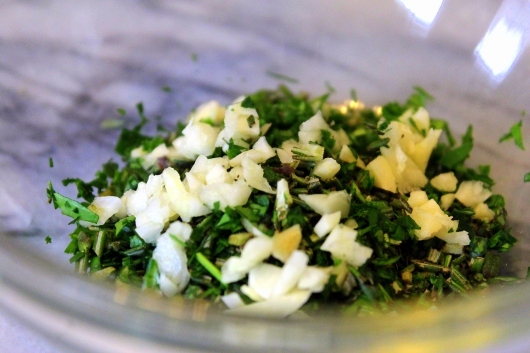 Put the herbs and garlic in a small bowl. Add a little salt, pepper, and a generous pinch of shredded Asiago cheese, and stir to combine. 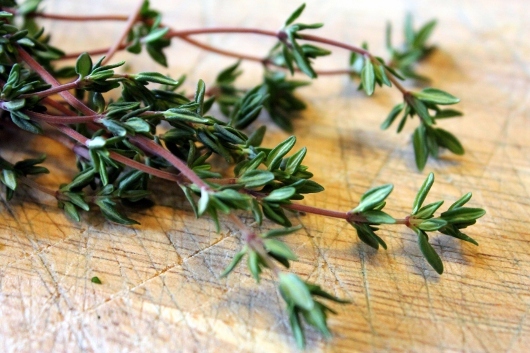 Are you a fan of Asiago? It’s a hard cheese like Parmesan, but with a deeper flavor. I love it. 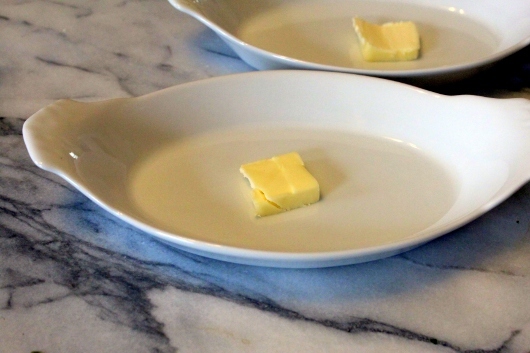 Next, put a little pat of butter in a small, fairly shallow gratin dish. 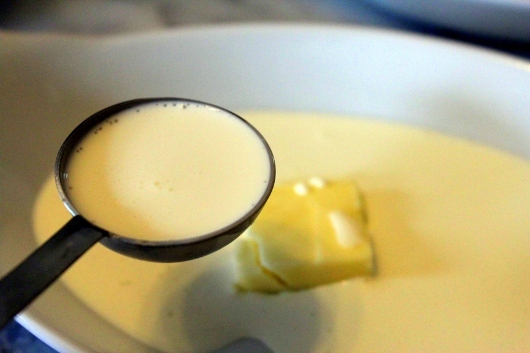 Pour a little heavy cream into the dish, while remembering that today is not a good day to start your diet. It’s also not a good day to ponder the glories of almond milk. Or rice milk. Or milk of magnesia. No picture of this next step, because your camera-wielding cook forgot to take one: Set the gratin dish (or dishes, if you are cooking for more than one person), on a baking sheet, and then pop them under the broiler until the butter melts and the cream starts to bubble — about 2 minutes. 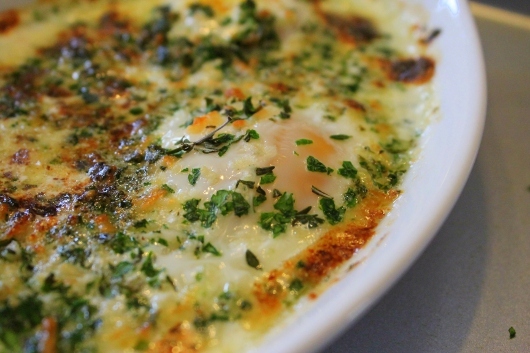 Remove the baking sheet from the oven, and — while the cream is still hot — gently tip the eggs into the gratin dish. 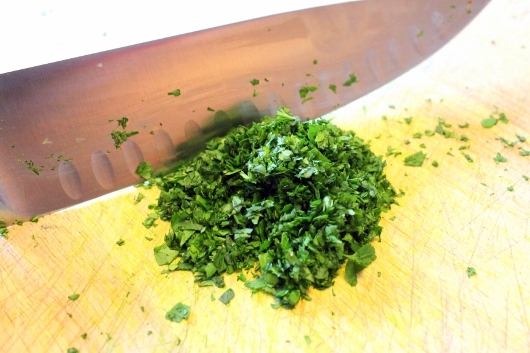 Then sprinkle the herb mixture over the eggs. Already this dish looks divine. It’s a pity we have to cook it. Pop the works under the broiler, and cook until the whites are set, and the cream is licked with bronze — 5-6 minutes. while your beagle looks on. 1. 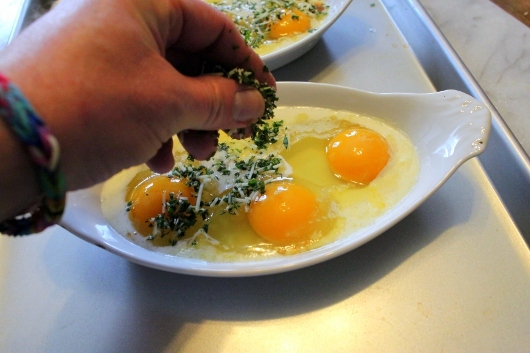 Taking care not to break the yolks, crack 3 of the eggs into a small bowl. 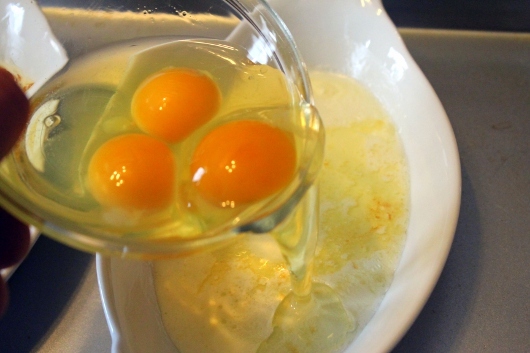 Break the remaining 3 eggs into another small bowl. Set the bowls aside. 2. 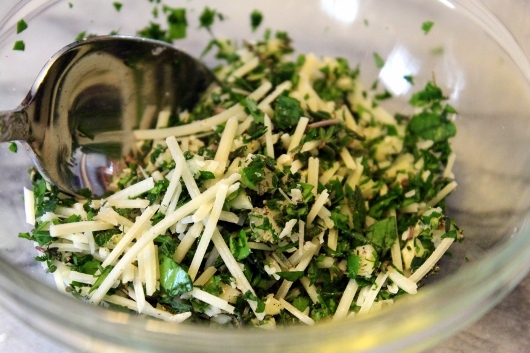 Mix the herbs, seasonings, garlic and cheese together in a small bowl. 3. Put 1/2 tablespoon butter and 2 tablespoons cream into each gratin dish. Set the dishes on a baking sheet, and broil until the butter melts and the cream begins to bubble — about 2 minutes. 4. Remove the baking sheet from the oven. 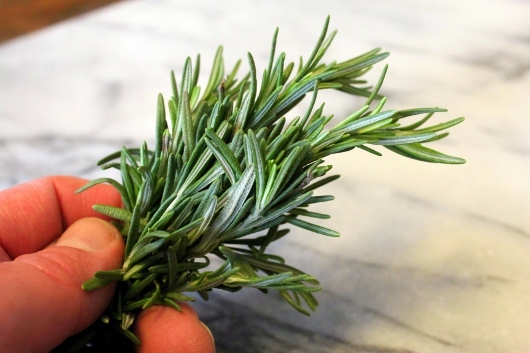 While the cream is still hot, quickly tip 3 eggs into each gratin dish, and top them off with the herb mixture. 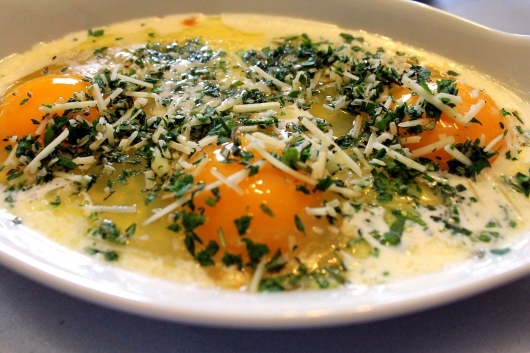 Broil until the whites are set but the yolks are still soft — 5-6 minutes. The eggs will continue to cook after they are removed from the oven. Serve at once with slices of toasted of baguette and goblets of ice-cold Sauvignon blanc. Ditto PattyM! 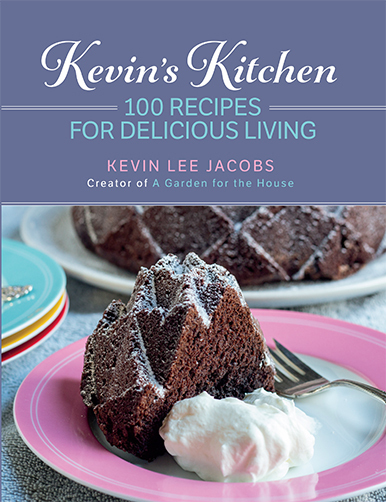 Thank you for sharing your wonderful recipes!! What Patty M. said OMG. Going to do this one for sure. My husband will think he has died and gone to heaven. Wow! I am making this when my husband gets home from the hospital. Light, tasty, what else can you ask? 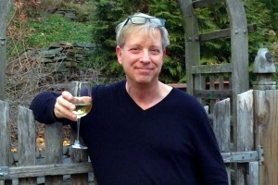 Thank you, Kevin, for your garden tours,weather updates, recipes and just general chat. You brighten more days than you can possibly imagine! Always an interesting read, Kevin. Thanks. This actually IS a good diet dish–if one counts carbs, like I do–I am guessing this has almost 0 carbs!!! (Of course, I will have to leave the bread off, but no worries!) Think I will make this tomorrow night’s supper! 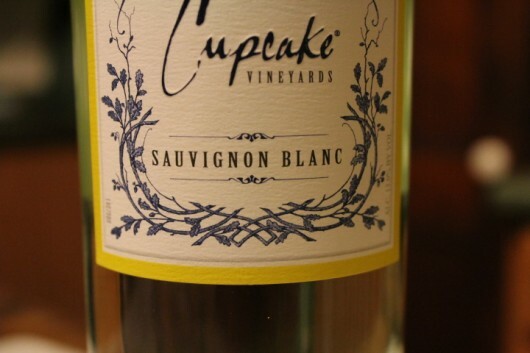 I am making this one today,Can’t wait , Looks yummy !! Kevin, I think you need to raise your own chickens. Imagine this dish using eggs laid yesterday! I got chickens about three years ago and they are such a joy! Beautiful, comical, colorful, and elegant (in a chicken-y way). You’d love them! This looks delish!! Do you think half and half would work? 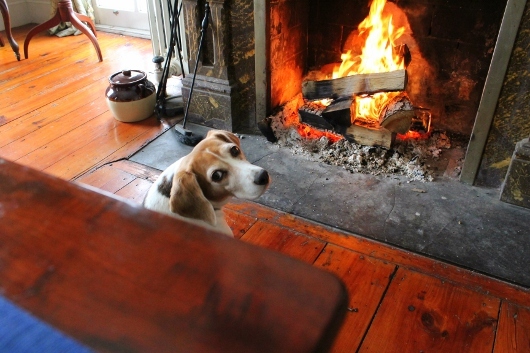 I love the beagle pics! Looks like it will be on the menu this week..
Now I have to find some gratin dishes, I guess :-)) It sounds wonderful as it is, but I might try crumbling some cooked bacon into the cream step for even more flavor and protein. YES! tonights supper !!! Tks Kevin!!! Kevin- thank you for opening your home to us. Every week I check my e-mail to see what’s new with you. 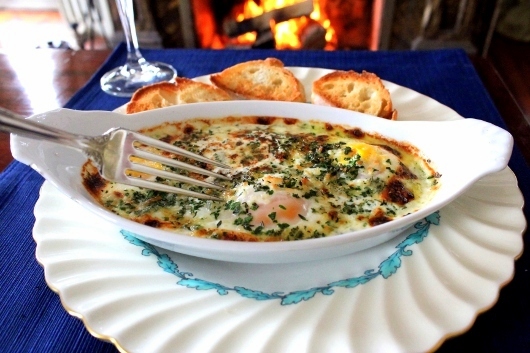 I am an egg lover and will definitely try this recipe. day. This looks like a wonderful treat and also healing food. Thank you. I just used my last stored garlic head from the crop harvested in July 2013. I know I will miss being able to zip into the cool garage to replenish the pantry. My current garlic crop is under the snow, hopefully poised to burst forth. If my garlic harvest was snowbound in a shed, I would hire that same guy who pruned my boxwoods to shovel the path and free up the doorway. I am SOOOO Making this for Friday! Yummy. Even Lily is saying so! I made this twice so far (lunch and breakfast). The first time that I try a new recipe I follow the directions exactly and then change it up the next time to suit my liking. I didn’t change a thing! 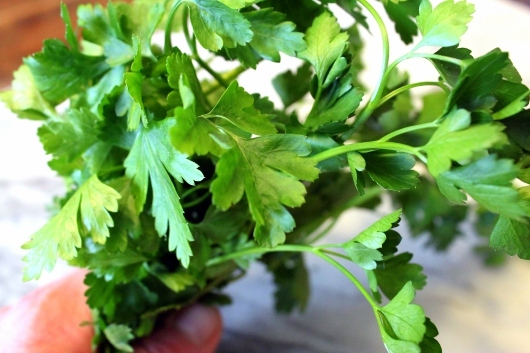 Really good and easy recipe! Thanks Kevin! Thank you so much for sharing this recipe. I had nothing in the fridge today but eggs, cream, cheese and garden herbs. Whipped it up and it was absolutely delicious!!!! Definitely a keeper in my house! You are the greatest, Kevin- thank you so much for sharing with us. I too, am always so happy to find you in my email. I always love to see what you are up to. You “had me” when you did the violets post – ! Thank you, thank you.